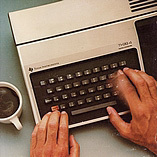 There are many places on the Internet where one can read about the original TI-99/4 computer that was released before the TI-99/4A. However, most people (if not all) own TI-99/4 setup's that were made throughout various years (1979-1981) and do not have an entire setup manufactured during the TI-99/4's very first year of production, 1979. Sure, one could find a TI-99/4 that was made in 1979, but my goal is to build an entire 1979-made setup where everything from the console/monitor straight down to the boxes are all dated 1979! To actually build a system with everything that was available and manufactured in 1979 would not only be interesting to have, but also a historical piece since it would be the setup that started it all back in 1979. If you are interested in finding out more on this project, head to the 1979 Setup Project section below. Early in 2007 I decided to try and build an original "everything made in 1979" TI-99/4 setup. This meant that if you could afford everything that was on the market for the 99/4 in the first year of production, what all could you have bought? This might not sound too hard at first, but the catch is that everything also had to be MANUFACTURED in 1979! The main motivation behind doing this is because nobody that I know of has attempted to build a fully blown 1979-made setup, and having the original first year system/items all together would be a nice historical piece for the 99/4 and 99/4A computers. Who knows if building such a setup will be even doable in 5-10 years time, as it's already hard enough just to find 99/4 items made in any year. Now you might be wondering how I can tell if items are actually made in 1979. Well, the nice thing about Texas Instruments is that when it came to labeling their cartridges, boxes, hardware, etc. they pretty much put date codes on everything (date codes in 1979 would start with LTA and can usually be found on the bottom of cartridges and hardware). Something that carries a date code of LTA 4779, for example, would mean it was actually manufactured in the 47th week of 1979. It's these date codes that make my quest possible. All of the 99/4 items pictured in the sections below were available in 1979, some of which are from my own collection (since I don't have everything that was manufactured 1979, I had to ask permission to use other people's pictures to give a glimpse on what certain items looked like). I also included a table which shows the items that I personally own towards this project and what the date codes/copyrights are on them. Only the items that have a 1979 date code and copyright are counted towards this project, and if you have anything that I am missing shoot me an e-mail at bryan@ti994.com. I figured it's probably about time someone put together a fully-blown 1979 manufactured TI-99/4 system, since it would be the one that started it all. To date I do not know of anyone who has put together a complete 1979 setup, so hopefully this will not only be a first but also a great way to showcase the original TI-99/4!